Print out a Union Mission Information Card to give to a homeless person in need. Your donation can make a difference in the life of someone in need. 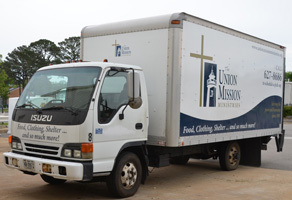 Schedule a donation pick-up today or call (757) 627-8686 ext. 604 for more information! To connect with someone in our ministry please complete the form below. Include your name, phone number, and email address and the information you wish to receive, or call us at (757) 627-8686. Someone will contact you in the near future.